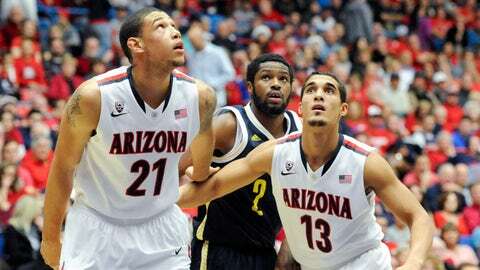 Brandon Ashley (left) and Nick Johnson are returning veterans for top-ranked Arizona. TEMPE, Ariz. — The Pac-12 has asserted itself as one of the best conferences in the country in the seven weeks leading up to league play, and people have noticed. Arizona is a strong No. 1 in both major polls, Oregon is in the top 10 in both, and they are two of the eight remaining unbeatens in Division I. Colorado is also ranked in the AP top 20. Houston transfer Joseph Young is averaging more than 20 points a game for unbeaten Oregon. As might be expected, there have been some attention-grabbing victories. Arizona has beaten Duke, Michigan and San Diego State, wins even more notable because none was at McKale Center and two were true road games. Colorado beat Kansas at altitude. Stanford won at Connecticut. Oregon has won overtime games against BYU and at Mississippi. Arizona State beat Marquette. On the flip side, it is almost impossible to find the kind of bad loss that plagued the conference when it went through its reloading cycle from 2009-12. The Pac-12 can feel good about itself as the infighting begins. At the same time, coaches will leave the national debate alone while letting the results be the judge. "I think we can be considered in the same conversation with the very best conferences in the country," Arizona State coach Herb Sendek said. "If I was to split hairs and say who was better, to me that’s a ridiculous road to go down. It’s so easy to sit and say ‘We’re the best.’ But we’re at least formidable enough that we need to be part of that conversation." The Pac-12 begins conference play Thursday with 12 winning teams and a clear-cut favorite in Arizona, which has a star or a star-in-the-making at every position, including the sixth man. Point guard T.J. McConnell has been one of the top impact transfers in the league, and freshmen Aaron Gordon and Rondae Hollis-Jefferson have provided strong minutes as the Wildcats are one victory short of their 14-0 start a year ago, although coach Sean Miller sees a different approach this year. "To me, we have a team that I think are more prepared and understand how difficult it is to win in the conference. We’re much more focused, sharper and more mature than a year ago," said Miller, whose team is limiting opponents to 37 percent shooting from the floor. The favorite coming in does not always come out on top. UCLA won the league by one game last year over Arizona, Oregon and California, and all that got Ben Howland was fired. Oregon won the conference tournament a year ago, when five Pac-12 teams advanced to the NCAA tournament for the first time since six made it in 2009. League play begins with the 12 teams combining for a 118-32 non-conference record. On their home courts, the teams are a remarkable 94-6. Oregon is a strong threat again. The Ducks beat Arizona at home last year and won the Pac-12 tournament, capping a season that took a hit when productive freshman guard Carlos Artis missed about a month with a foot injury. 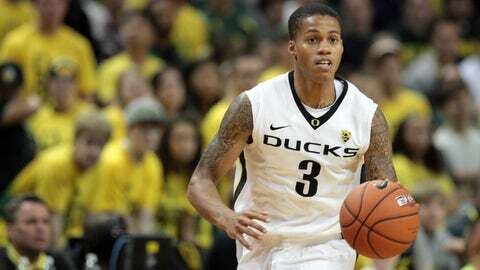 Artis missed the first nine games of this season while serving an NCAA suspension for accepting extra benefits, but Ducks coach Dana Altman again has found reinforcements from the transfer pool. Guards Joseph Young (Houston) and Jason Calliste (Detroit) and forward Mike Moser (UNLV) are the Ducks’ leading scorers. Altman previously banked two years of mileage out of Wake Forest transfer Tony Woods and one out of Rice transfer Arsalan Kazemi last year. "I didn’t really know how it would all come together. They have blended together well. (Young) is a natural scorer. You put the ball in his hands and try not to over-coach him," Altman said of Young, a 6-foot-3 junior who is third in the league averaging 20.2 points a game. Other transfers have made an impact. 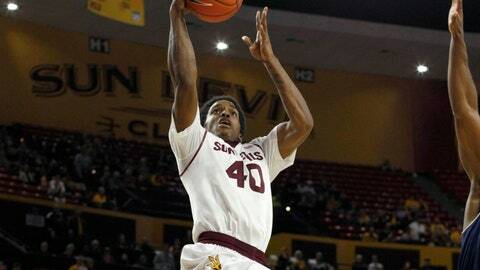 Arizona State guard Jermaine Marshall (Penn State), Utah guard Delon Wright (junior college) and Washington forward Perris Blackwell (San Francisco) are averaging at least 12 points a game, as are Moser and Calliste. UCLA guard Zach LaVine from suburban Seattle leads Pac-12 freshmen in scoring at 12.2 points a game entering league play. The Bruins were ranked early in the season under new coach Steve Alford but dropped out after losses to Missouri and Duke. USC has the league’s other new coach, Andy Enfield. "He’s been tremendous," Alford said of LaVine. "He creates his own shot, he’s great in transition and he’s getting better and better defensively." The unbalanced schedule will likely play a factor. At first glance, it seems to favor Oregon, which misses Colorado at home and the Bay Area road trip. UCLA does not play the Arizona schools on the road. Colorado does not play the Bay Area schools at home. The Washington partners miss the Arizonas at home and the Los Angeles schools on the road. "I think it is going to be really exciting 10 weeks. I think we have anywhere between five and seven teams talking about making the NCAA tournament," Arizona’s Miller said. "The depth of our conference has never been better since I’ve been here. It is going to be difficult to win any game on the road."